Use once a month for 1 hour. Use Monthly Whitening Boost for a monthly boost to your white smile for noticeably whiter teeth after just one strip. Enamel safe, you can brighten daily to protect your whiter teeth from everyday offenders like coffee, tea, wine and cigarette smoke. Monthly Whitening Boost keeps your teeth whiter for longer to ensure your smile stays beautiful. Advanced Seal Technology helps the strip to mold to the unique shape of your teeth and also come off cleanly and easily. Their no-slip grip means the strips stay put until you take them off, allowing you to talk and even drink water while whitening your teeth. Using them just once a day for 60 minutes elevates your whiter smile to the next level. 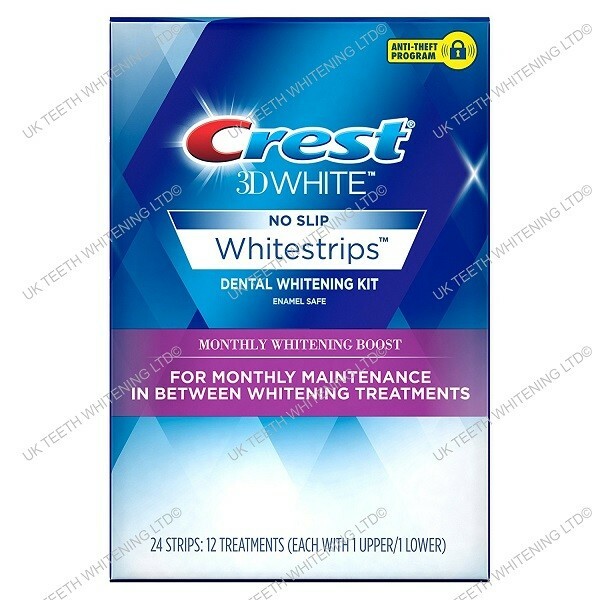 Ideal for protection against everyday stain buildup from things like coffee, tea, and wine, Crest 3D White Whitestrips Monthly Whitening Boost whitening strips gradually whiten your teeth to give you whiter teeth in just 60 minutes each day. Crest Whitestrips can also help you maintain your already white teeth.